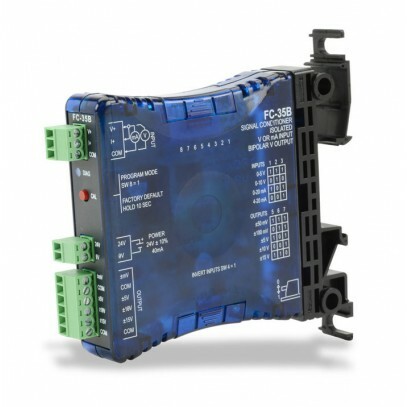 Signal conditioner and isolator with field configurable input and output, unipolar input ranges of 0-5V, 0-10V, 0-20 mA, or 4-20 mA; bipolar output ranges of +/-100mV, +/-50mV, +/-5V, +/-10V, or +/-15V; input can be field calibrated with offset and span adjustments. Slim-line plastic housing with integral 35mm DIN rail mounting adapter, LED indication and removable screw terminals, 24VDC supply voltage. UL 508 listed, CE marked.